We have nothing to fear from the incoming Comet ISON, no matter how the icy object behaves during its much-anticipated close approach to the sun this November, scientists say. Comet ISON will miss Earth by many millions of miles during its swing through the inner solar system — and so will its bits and pieces, if the comet happens to break apart along the way. 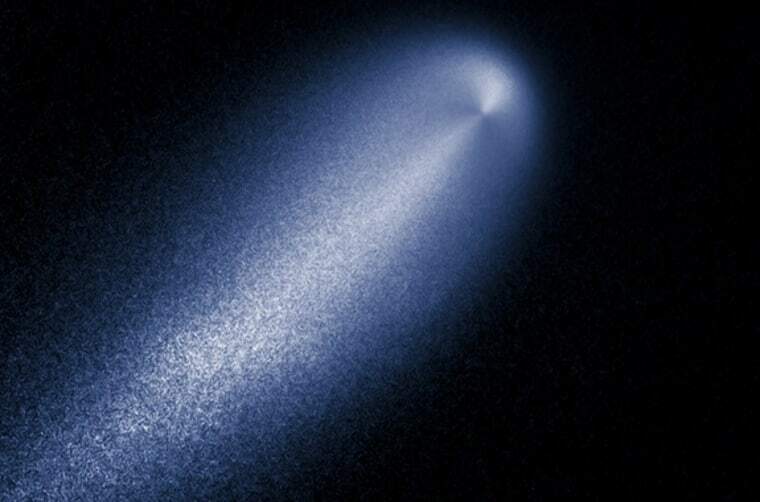 "During a breakup, comet fragments don't fly off in different directions like shards in a cinematic explosion," explains a new Comet ISON video released by the operators of NASA's famous Hubble Space Telescope. "They break off but continue to travel along the path of their parent body. So any pieces would remain far from us, millions of kilometers away." While a breakup would be bad news for skywatchers hoping for a great show from ISON — which was billed as a "comet of the century" candidate almost immediately after its discovery in September 2012 — it could have a silver lining. "If a breakup happens, we may be fortunate enough to witness a beautiful 'string of pearls' in the sky, similar to what Hubble observed when the comet S-W 3 broke up in 2006," the narrator adds. Scientists think Comet ISON is making its first trip to the inner solar system from the Oort Cloud, a repository of trillions of icy bodies thought to lie 1 light-year or so from the sun. ISON is streaking toward a solar encounter on Nov. 28, when the comet will skim just 700,000 miles (1.2 million kilometers) above the sun's surface. If ISON survives that close pass, it could blaze up incredibly brightly in Earth's night sky, experts say. Skywatchers and scientists alike are keeping a close eye on ISON, trying to predict just how it will behave over the coming months. Recent observations are not terribly encouraging, suggest that the comet is not brightening as much as expected or hoped on its trek toward the sun. Editor's note: If you snap a photo of Comet ISON, or any other night sky object, and you'd like to share it for a possible story or image gallery, please contact Managing Editor Tariq Malik at spacephotos@space.com.